Do you own a DVD or CD player or even a printer? How about a remote control that operates your television? Each of these household items features a laser diode. This is a semiconductor device that emits waves of the same frequency and phase when power flows through them. The light beams emitted from laser diodes are not the pencil-shaped beams capable of mass destruction that you may be envisioning. Rather, they emit wider, cone-shaped beams of either visible or infrared light. They are low-intensity beams. They are tiny devices that are usually less than a millimeter across in size with minimal power requirements. A crystal wafer featuring p-type and n-type regions is one characteristic of these, and it is this feature that classifies them as semiconductor rather than solid state lasers. Diodes are similar to LEDs. In fact, LEDs have been described as lasers without feedback cavities. Laser diodes have internal or external feedback cavities which are used to trigger laser action. High Q cavities narrow emission lines and beams. These beams are not nearly as sharp or narrow as gas laser beams. These emit visible or infrared light. Colors range from blue, blue-violet, and green to red. The usage of the laser diode depends in large part on its wavelength and position on the light spectrum. For example, Blu-ray disc players use blue-violet 405nm laser diodes while red laser pointers use laser diodes in 635nm range. Tough tiny in size, laser diodes are the most common type of laser. They’re found in the items mentioned above as well as barcode readers, fiber optics, optical mice, range finders, laser pointers, and medical equipment. While they are not as hazardous as gas or solid state lasers, they must still be used with care. 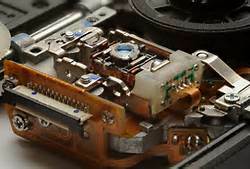 In some cases, such as CD and DVD players, laser diodes are housed inside the unit and not intended to be seen. In addition, their low output beams are nearly invisible and highly divergent. In contrast, laser pointers have a higher output and are highly visible. Laser pointers are collimated, and it is possible for high powered laser pointer beams to burn the retina of an eye. Laser pointers can also cause less substantial effects such as headaches, afterimages, and visual distraction when not used properly. A greater danger is associated with higher powered visible and infrared diode lasers. Even invisible beams can be dangerous if they are collimated. Because of the potential for eye injuries or burns, it is prudent to use care whenever a diode laser is present. Never look into the beam of a laser or point a laser pointer in another person’s eyes. Be aware of the reflected laser beams as well. Small, powerful, and useful, they have become increasingly common. In many cases, you’ll never see the beam, but you should be aware of it and avoid the temptation to look at it or alter it an any way. Mark Williams wrote this article about the many uses of a laser diode. Mark has worked with all types of laser tools, from laser cutting machines to long range measurement devices. Article Source EzineArticles by Author Mark Williams .